I was over at my son and daughter in laws house watching my littles when this accident happened. The happy one, that is. I was told there was chicken in the fridge that needed used, I found some chips and decided to make chicken fingers. They were fabulous. I used minimal ingredients, and they were awesome dipped in some queso. My littles are all about dipping! The next time I made this, I tossed in a packet of taco seasoning, just to see how it would taste. Holy taco chicken batman. Delish! If you don't groove on the store bought packets feel free to use your own homemade. This is so kid friendly, get them in the kitchen with you! 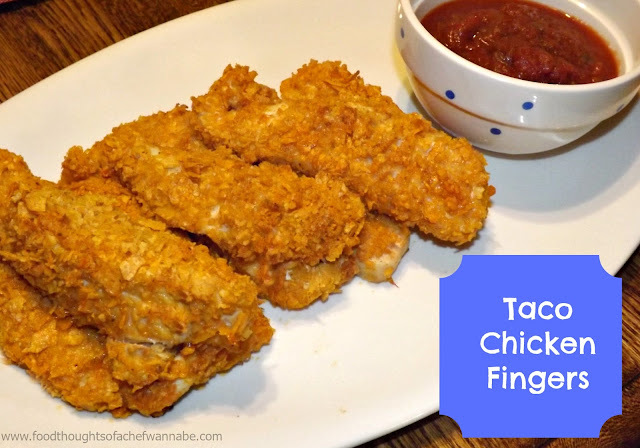 It is fun, good, and if you make it into nugget shaped pieces you could use it for an appetizer or just make nuggets for eating! Preheat your oven to 400 degrees F. In one bowl combine corn chip crumbs and taco seasoning, in the other melt 1 stick of butter. Line baking sheet with foil. Dip the chicken strips in the butter, and then coat in the crumbs. Make sure to press crumbs into the chicken well! Place on your baking sheet until all of the chicken is coated! Bake for 20-25 minutes until chicken is completely done, and the outside is crispy! Make sure not to over cook! I served these with salsa for dipping. OMGOSH, delicious!